Rich West - "Mayo Grout's Known Universe"
Drummer/percussionist Rich West has had a long career in music. Despite being a member of an early incarnation of Camper Van Beethoven and the space/psych group The Mooseheart Faith Stellar Groove Band, his true passion seems to lie in the realms of avant-garde jazz. 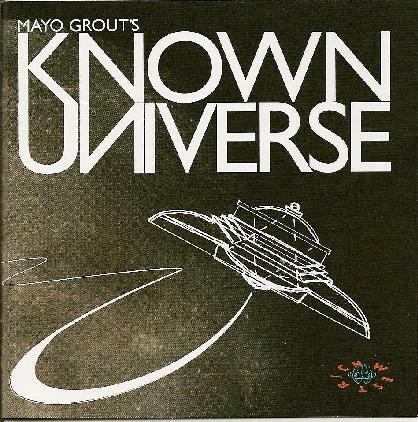 This has been evident from one of his earliest projects, the orchestral rock band The Wrestling Worms in the early 80's right up to his present day solo efforts like this one, Mayo Grout's Known Universe. Blending percussive orchestral music in the vein of 20th century classical futurist Edgar Varese with a Charles Mingus-like approach to jazz and the progressive rock fusion of Henry Cow and Waka/Jawaka era Frank Zappa, West creates his own unique little universe that he attributes to the mind of Mayo Grout, the cockroach obsessed character of the title. It's not easy music to listen to, as is most often the case with the avant-garde. Whilst West doesn't stray into the totally free form very much, there are passages of such chaos, as well as lengthy, growling ruminations from Mayo Grout and weird little sing song melodies punctuating the more improvised (and sometimes very psychedelic) jams. Flutes twitter, horns blurt and howl, bass throbs menacingly, guitar rumbles, and West's percussion veers from the wildly random to precision complexity. Mayo Grout's Known Universe is a crazy ride indeed, but fans of the above-mentioned artists as well as Canterbury bands like The Soft Machine will no doubt find great enjoyment in its off-kilter twists and turns.